Everyone who has ever been to Tuscany has fallen in love with its history, charm, and, of course, its FOOD! Italian Tuscan style recipes have made their way all over — even to Cape Cod — so try this Tuscan Style grilled lobster recipe just in time for Father’s Day 2014. Visitors to Italy often learn that the Italian food they eat there often does not look, or taste, the same as it does back home. But the regional distinctions and flavors of Italy often translate very well to dishes prepared using our wonderful New England seafood. From a Boston fine dining Ristorante to a seacoast resort, New Englanders love their seafood prepared with the flavors of Italy. We are fortunate to have Chef Dan from the Lobster Trap Restaurant in Bourne, Mass share his recipe for Tuscan Style grilled whole lobster. This Italian style dish has been given just the right Cape Cod touch. 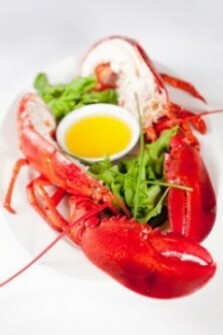 Be sure to start with fresh, live hard-shell whole lobster. Preparing whole live lobster for the grill can be a bit intimidating for first timers, but trust us, the results are worth it. So go ahead and try Chef Dan’s Tuscan Style grilled lobster recipe. And enjoy!.